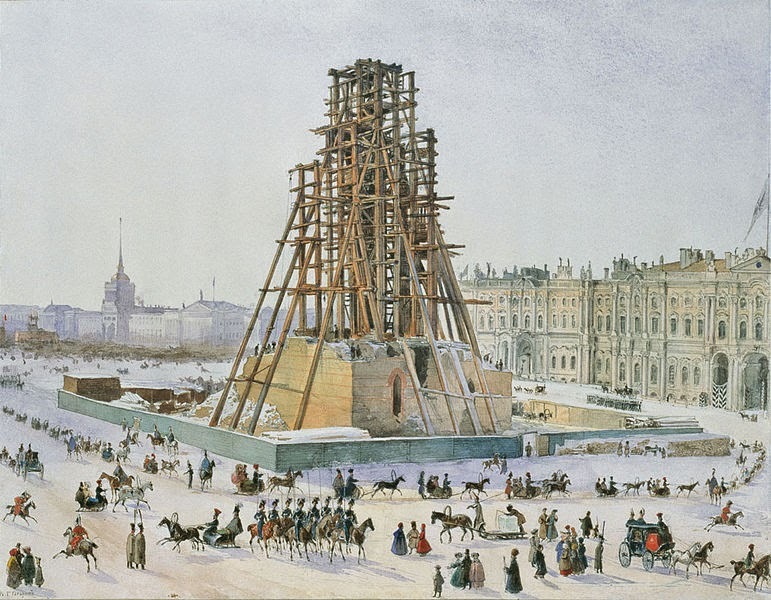 The Alexander Column stands at the centre of Palace Square in St Petersburg, Russia, a permanent monument to Russia's victory over Napoleon. Montferrand designed the Column before passing on responsibility for the building in 1830 to Swiss Antonio Adamini. The column stands at 155 ft 8 in and is topped with a statue of an angel holding a cross designed by Russian sculptor Boris Orlovsky, with the angel bearing the face of Emperor Alexander I, for whom the column is named and it was unveiled on 30th August 1834. The column is formed from one single piece of granite that was sourced in Finland and transported by sea to Saint Petersburg, where 3,000 men erected it. The enormous pedestal on which the column stands depicts winged figures holding up a plaque bearing the words "To Alexander I from a grateful Russia" and shows iconic items of armour from the history of the country, a reminder of the rich heritage of Russia. On other sides are depictions of virtuous acts and courageous tales, designed by Giovanni Battista Scotti. The casting of the bronze was done at Charles Baird's works in Saint Petersburg and was, as you might imagine, a monumental undertaking. Over the decades that have passed since the Column was finished Russia has sent its share of upheaval and change. Through it all the Alexander Column has stood solidly by, a reminder of the country's past victories and rich history. 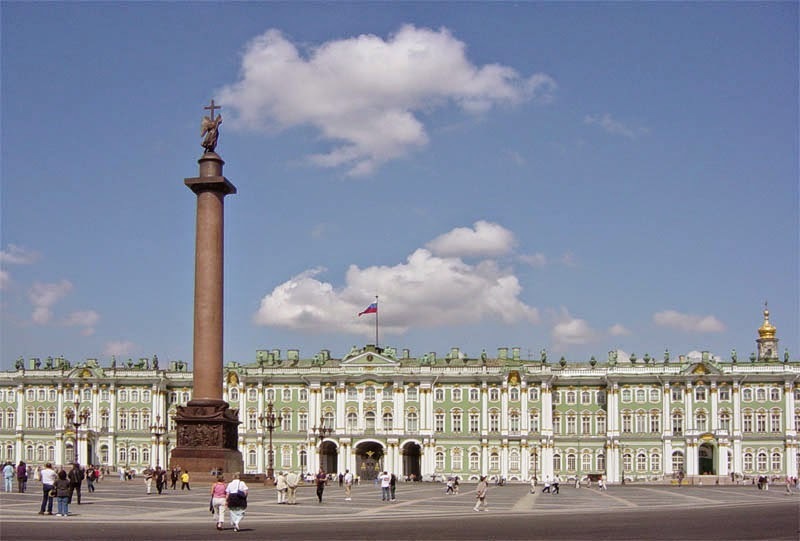 Palace Square is an impressive space, so any column erected would have to be equally impressive to avoid being dwarfed by it's location. I would love to see it in person one day!